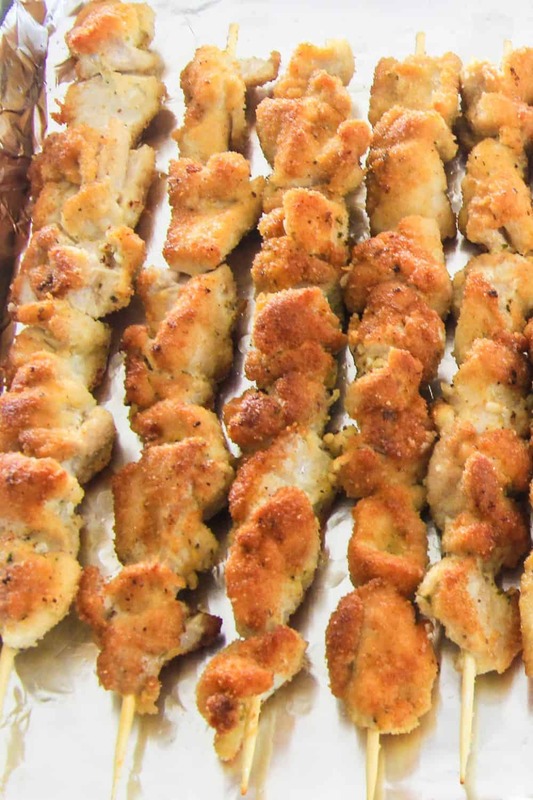 These breaded chicken skewers are one of my favorite dishes to serve to guests. They can be prepped and lightly browned in advance. I like to wait until my guests arrive, then quickly finish them in the oven. Generally when having guests over for dinner, the oven becomes my best friend. I use chicken thighs in this recipe because they tend to have more flavor and aren’t as dry. 1. Cut the chicken thighs into 1-2 inch pieces. 2. 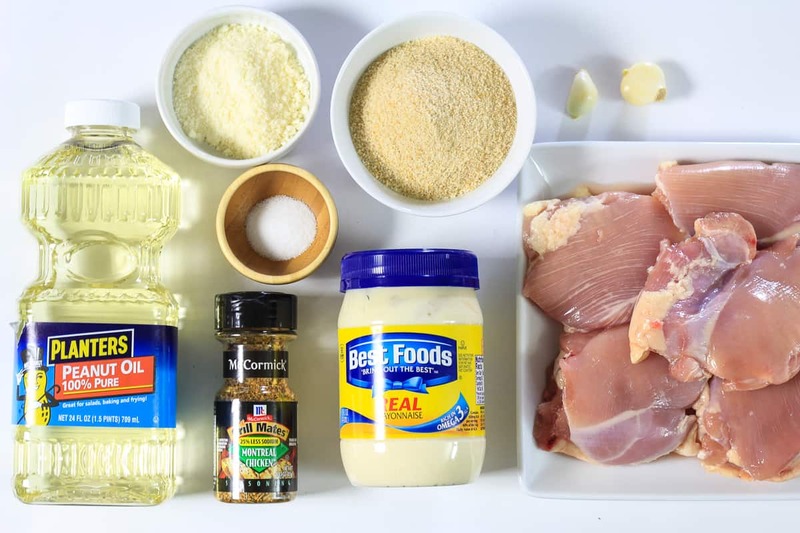 In a bowl combine chicken, mayonnaise, salt, Montreal chicken spices, and grated garlic. Let the chicken marinate in the refrigerator for at least 4 hours, or even overnight. 3. Place the chicken onto the skewers. 4. Mix the Parmesan cheese and bread crumbs together. Coat each chicken skewer in the bread crumbs. 5. Heat oil over medium-high heat and brown each side of the chicken skewers. 6. Place the browned chicken on a baking sheet lined with foil and bake for another 15-20 minutes at 350 degrees Fahrenheit. Serve warm. Cut the chicken thighs into 1-2 inch pieces. In a bowl combine chicken, mayonnaise, salt, Montreal chicken spices, and grated garlic. Let the chicken marinate in the refrigerator for at least 4 hours, or even overnight. 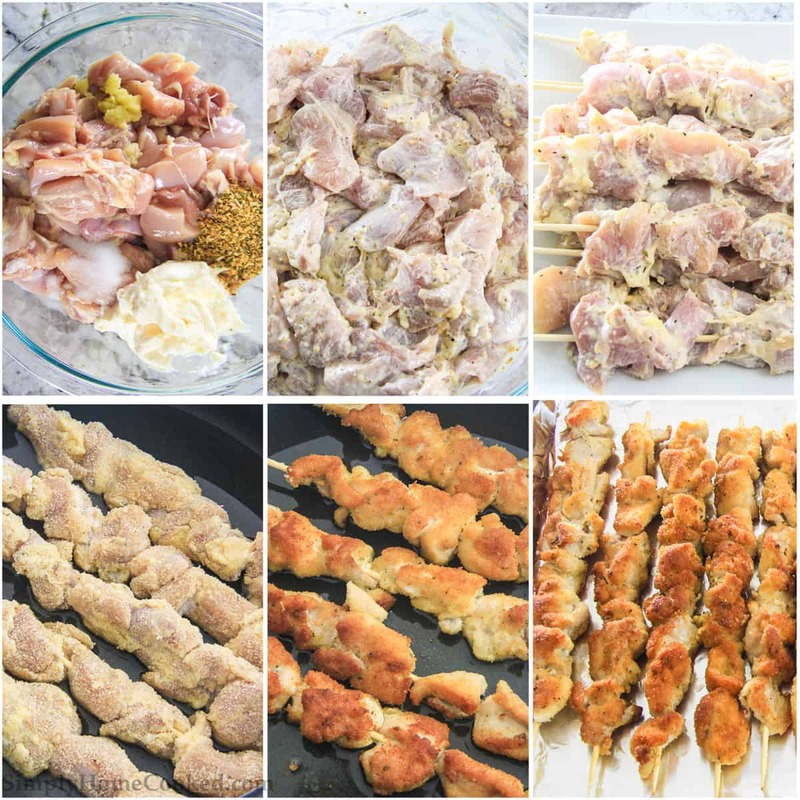 Place the chicken onto the skewers. Mix the Parmesan cheese and bread crumbs together. 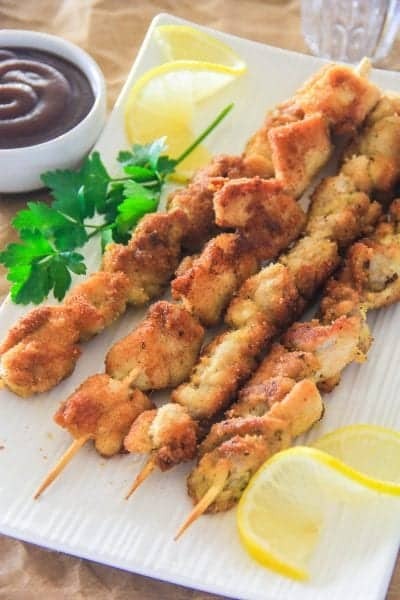 Coat each chicken skewer in the bread crumbs. Heat oil over medium high heat and brown each side of the chicken skewers. Place then browned chicken on a baking sheet lined with foil and bake for another 15-20 minutes at 350 degrees Fahrenheit. Serve warm. I didn’t read the recipe to the end. It’s now marinating with the Parmesan included and I scraped out most of the bread crumbs from the marinade. Should I put Parmesan with the bread crumbs now or should I omit it? I would omit the parmesan cheese at this point. Only dredge in breadcrumbs now. Just found this recipe, and will be trying it soon! I think I’ll use Olive Oil to cook them in, because a favorite Parmesan Chicken recipe does that, and its great! Can’t wait to try it. I Hope you enjoyed the breaded chicken skewers Andrew! Delicious recipe, worked well with Portuguese spice & cooked on the BBQ went really well. Possibly not as crispy as fried then oven baked but when using thigh meat I think there is enough fat in those to keep them moist & fry well on the BBQ. still were crispy, just not crunchy….though I’ve never tried your fry & oven bake version. Definitely doable on the BBQ & hubby loved them too. Thanks! Thank you for getting back to me Sarah! I’m so happy this recipe was a winner for you and your husband! Super quick and delicious. Definitely my go to dish. Especially with a side of potato and salad!